It has been nuts around here these past few weeks. Nuts, I tell you. Little Man came down with a stomach bug that resulted in a whole lot of grossness (and carpet cleaner), I went to a 4 day work conference (that resulted in me coming home with a whole lot of awesome tchotchkes like a troll pencil topper), we took an all too short family vacation to Vancouver, only to come home to a broken sprinkler that had created a moat around our house. Oh, and Ramadan started so the lack of coffee has resulted in an all too predictable lack of coherence and efficiency on my part. See, I told you it's been nuts. 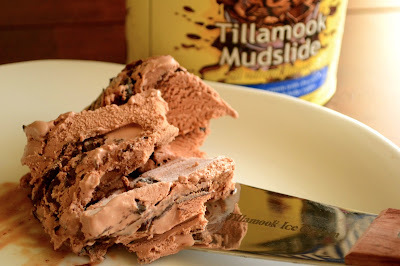 So when the good folks at Tillamook contacted me to see if I wanted to sample some of their ice cream in celebration of National Ice Cream Month, all I could gratefully say was, "Yes, please." 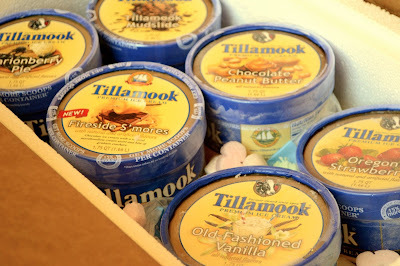 Somewhere in the middle of all the chaos above, Tillamook sent over not one but six containers of ice cream in the mail. An actual ice cream delivery?! Be still my heart. It was like a much needed gift from God. A perfectly cold and creamy gift. Now don't get me wrong, I like eating ice cream straight from the carton (often) but when you're fasting and haven't eaten all day, you really need to take your ice cream to the next level. 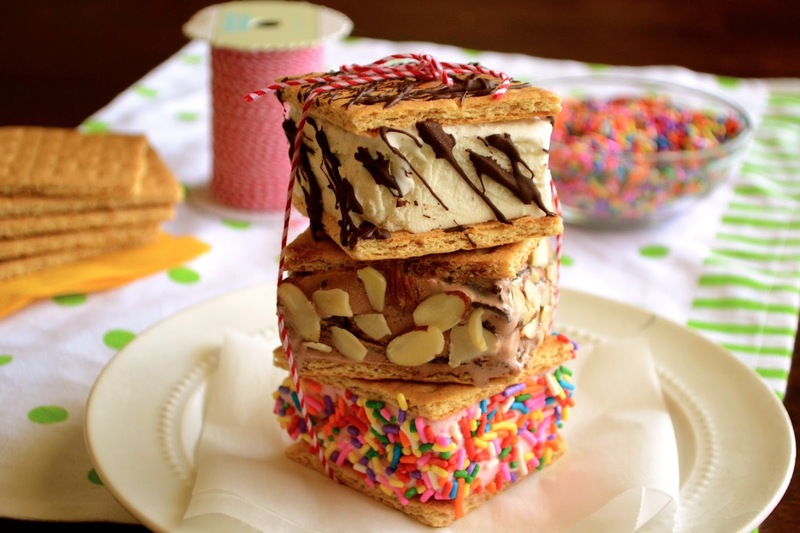 Introducing "homemade" ice cream sandwiches. Various flavors of ice cream, sandwiched between graham crackers and covered in delicious toppings like sprinkles, toasted almonds, and melted chocolate. Now before you start freaking out that these are not homemade, keep in mind I scooped the ice cream from the carton, sandwiched it between graham crackers, and covered the delicious concoction in toppings so in my world, at least these days, this qualifies as homemade. And when you can't eat all day, ice cream sandwiches for dinner are perfectly acceptable (and recommended)! Let's start with a classic. I love store-bought vanilla ice cream sandwiches but often find the ice cream to be a bit lacking. Too much air, not enough cream. You know the drill. Enter Tillmook's Vanilla Ice Cream which is definitely one of the creamiest I've ever had. Oh, and I would really like some chocolate in my vanilla ice cream sandwiches. Tada! Vanilla ice cream sandwiched between graham crackers and drizzled with melted dark chocolate. I opted to use regular graham crackers because I didn't want the chocolate to be too overwhelming (as if!) but feel free to use chocolate or better yet, cinnamon graham crackers. We also happened to make a Chocolate Mudslide ice cream sandwich topped with toasted almonds along with a Strawberry ice cream sandwich covered in sprinkles. As I was wrapping a few of 'em up in foil (gotta be prepared! ), I realized these would be the perfect treat for your next summer party. Think about it. Wouldn't you rather have a customizable ice cream sandwich as opposed to a hum drum one from a box? Yes, yes you would. Go ahead and print off the $1 Tillamook Ice Cream coupon below so you can make your own fantastic ice cream sandwich (http://bricks.coupons.com/Start.asp?tqnm=wgnxcod98762965&bt=vg&o=112791&c=MX&p=vsEmrgDy). The $1 off Tillamook Ice Cream coupon will be available until July 31, 2013. It will expire within 30 days of printing, so don’t forget to use it soon! Now if you'll excuse, I hear a Chocolate Peanut Butter ice cream sandwich topped with crushed cocoa nibs calling my name. The good folks at Tillamook sent me a lovely ice cream sample pack but all opinions are my own. Obvs. i need to do this ASAP and it will be great for parties for sure. Hope the little man is feeling better. What a great idea! Easy and fun and pretty, too. Thanks for the coupon! Dang that is an awesome thing to get in the mail for sure! Sorry for all the nuttiness but ice cream really does make everything better. Ice cream in the mail......a girl can only dream! These look ingenious! I didn't even know Tillamook made ice cream....I guess we can't get it in the US? I like their cheese though. I have been craving ice cream like its going out of style. But lately with Ramadan and eating so late, I rather just go to bed!! These sandwiches look fantastic though! Imma try making some soon..when I am not a zombie. You surely have taken it to the next level. Looks like a lot of fun. Nice to meet you Azmina and Happy Ramadan. How come I never get good pr like that? Love how you used your spoils. I like how you used the grahams for the sandwiches. Do you think a chocolate dipping sauce on the side would be too much? Happy Ramadan my friend. I hear you on the crazy front. But what fun would it be if we weren't crazy? How nice of them to send you ice-cream. Jeez 6 containers, I'd gain so much weight, but I'm not fasting that's why. 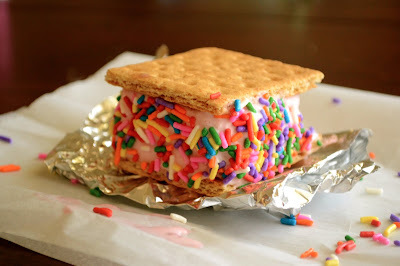 I love strawberry ice cream, really cool idea of making your own ice cream sandwiches. I had no idea that Tillamook made ice cream! I don't think they sell it here, at least not in the stores I frequent. I love their cheese and bet their ice cream is awesome. Nice score! 6 tubs of ice-cream! Wow, that mudslide one looks crazy good. Wow.... love your ice cream sandwich, AWESOME! Yikes, 6 containers. I am gaining weight as I read. And as I look at the yum pictures! I hope the little man is feeling better, as much as I hate puke, I hate it on carpet more. I think six pints of ice cream were definitely called for after a week like that! I'm totally jealous because Tillamook makes some of the best ice cream ever and we can't get it out here. I'm glad you enjoyed some in these awesome ice cream sandwiches! Thanks for sharing. The different flavor and mixes in every layer seems to make it exciting to taste. Nice post. I need ice cream in the mail service!! !